Pan-Dimensional Conga Combat (Finally) Submitted to Steam - Hopefully Out Next Month! 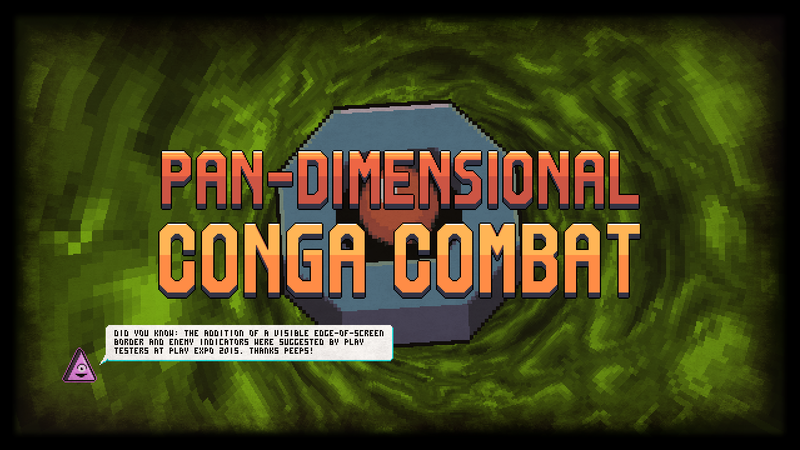 So, it's been a while since we discussed Pan-Dimensional Conga Combat here, hasn't it? If I'm completely honest, part of the reason that updating the game for Steam has taken so long was due to a severe lack of motivation following the initial release. Despite a positive outreach campaign on Twitter and a really great write-up on EuroGamer, we're still only at about 25% of the way to breaking even (being sold on both GameJolt and itch.io). Around the time we launched Conga back in 2016, our Greenlight page for the game had also stalled at just over 1000 views and was sat at around 33% to the top 100 with only 700 or so votes - a record low for RGCD. All of this combined had Jamie and I feeling pretty down in the dumps. Then, after months and months of zero sales, POW! An email out of the blue arrived in our inbox around the middle of last year from Valve saying that Conga Combat had been Greenlit. This really highlighted to me what a total bonkers system Greenlight was. I mean, I'm not knocking Conga Combat at all - Jamie and I are both proud of how the game turned out (even if it has completely failed to find an audience), but how exactly was it Greenlit when it was so far down on the list? Sure, considering the niche genre we had a pretty good split of yes/no votes (49/49% with 2% undecided), but only 1000 page views, and 700-odd votes? Wow, Conga Combat must be one of the lowest scoring games ever to break through the Greenlight barrier. But hey, at least it made it in the end. However, 'making it' presented us with another problem; we had to invest more time into the game to tick all of Valve's boxes for release. Time that, quite simply, we didn't have last year. If you'd like to receive a Steam key to assist us with beta-testing the new features, don't be shy! Drop us a line (via the contact form/Twitter/email) and we'll see you soon on the scoreboards! After releasing LuftrauserZ last month, a few people asked for a post-mortem on how Paul Koller created his opus, the demake that many thought was improbable -if not impossible- to achieve on the modest 8-bit breadbin. A brief making of both Luftrausers and LuftrauserZ is included within the game manual, but with a limited page count a great deal of info was missed. 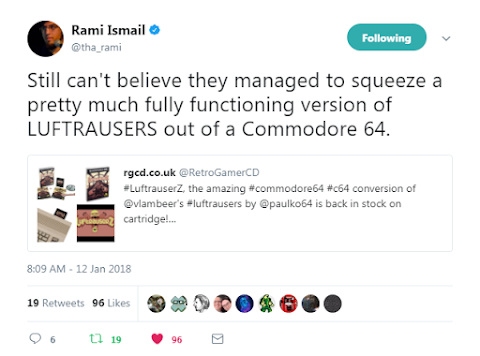 So, to rectify this and fill in the blanks, Paul has helpfully written the following blog post on the creation of LuftrauserZ. Of course, it would be foolish of me not to remind you that the game is (currently) available to buy again on cartridge and as a download. The cartridges don't tend to stay in stock for long though! Happy New Year all! Well, thankfully that's another decadent winter holiday behind us and it's finally time to escape the family and get back to work tomorrow (or at least that's the case here). 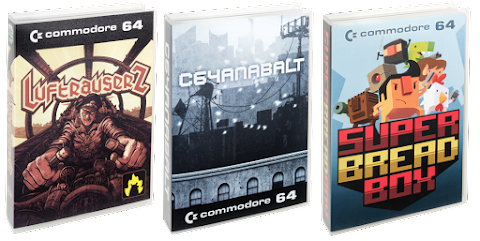 So, with only a few hours of free time left I thought I'd put it to good use and type a quick news post about our recent games restock and a few recent developments in the C64 scene that you may (or may not) be aware of. Ok, so the good news here is that all three of Paul Koller's cartridge games are currently back on sale - the all-new LuftrauserZ, and the re-released C64anabalt and Super Bread Box, both of which are now complete with new professionally printed manuals and labels. If you missed them first time around, now's your chance to grab them! In addition to this, Jam It!, Moonspire, C-2048 and Powerglove are available again on cartridge, with a reissue of Space Lords and Bomberland currently planned for next month. Check out the available games in our revamped shop. If you follow the Commodore 64 games scene then there's no doubt that you’re already aware of this, but the long-awaited Sam's Journey by Knights of Bytes was released on the 24th December - and here at RGCD we've been giving the game quite considerable screen time. It's a totally amazing game that you should most certainly check out (if you haven't already). Head over to itch.io for the download, or Protovision for the physical release! On a related tip, prior to the release of Sam, Protovision launched Jason Aldred's excellent old-school arcade blaster Galencia as a download, disk and cartridge, so check that out ASAP! Last but not least, Richard of TND released an awesome little shmup over Christmas that you should grab. Starfysh, a collaboration with WEC (whom previously worked with Richard on Woolly Jumper), makes up for its short duration with some quality music, amazing artwork and pure blast-em up action. 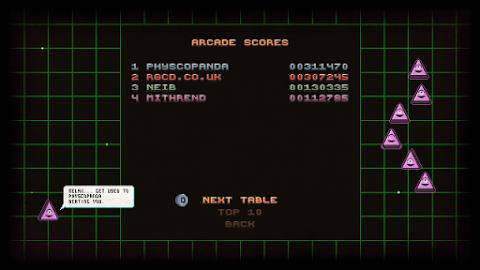 It's one of our favourite TND games to date, and certainly worth downloading from either CSDB or TND.